We weren’t getting very far looking for the similarities to the Beatles amps, because despite all our efforts, no photos have been released of the inside of the Beatles models. We can’t see around corners, and we can’t see into the past with x-ray eyes. We tried looking at the problem from both sides, asking if there was any evidence for and then against it being of the time the Beatles amps were made. The only thing that really stood out as being visibly different from what we could make out in the photos of the Beatles amps initially available to us was the power connector. 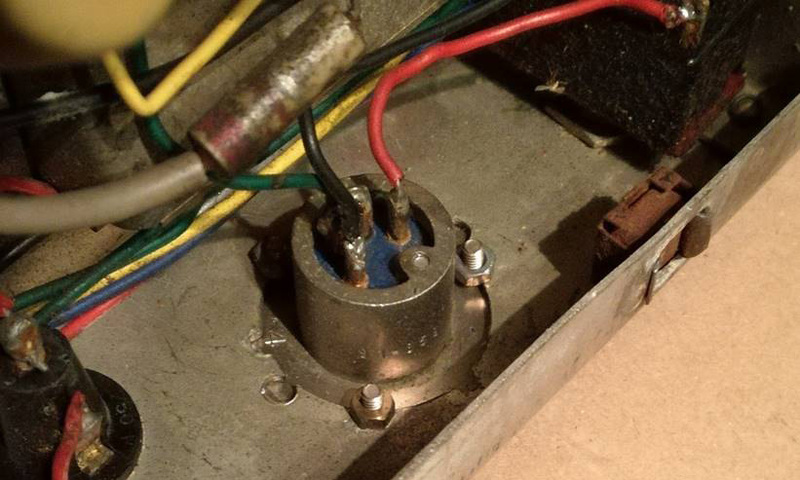 Photos show the Beatles 7120s with a round Amphenol connector, held by 3 bolts. Detail of one of the Beatles’ amps on stage, Munich, 24th June 1966. This Swiss amp had the same thing; but we could see something was different though. 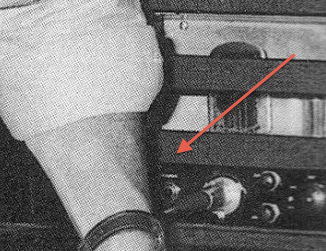 On the Swiss amp, the socket was mounted upside down (red dot at bottom). The Swiss amp’s Amphenol power socket. The owner of the Swiss amp understood how difficult it would be, given the lack of details of the Beatles models, to tie it to any particular part of the development timeline. He was very helpful though providing what information he could, and sent some photos, including one showing the power plug from the back. Note that the provision of red dots on power sockets was something that Amphenol only did for Vox – an order that presumably went through the Amphenol factory at Whitstable, a short way down the Kent coast from Dartford. Currently of course the socket is upside down; and the factory-made hole in the chassis – ie. factory-made at Triumph – is for a larger Bulgin bakelite fitting. Above, a standard British Bulgin chassis socket and connector. When one looks at the back of the Swiss amp’s socket in detail, however, it becomes clear that the Amphenol was originally fixed in the hole the correct way up initially and later remounted (turned by around 170 degrees) when its fixings loosened. New fixing holes were made to secure it. Remember, this is an Amphenol specially made for Vox (with a red dot). 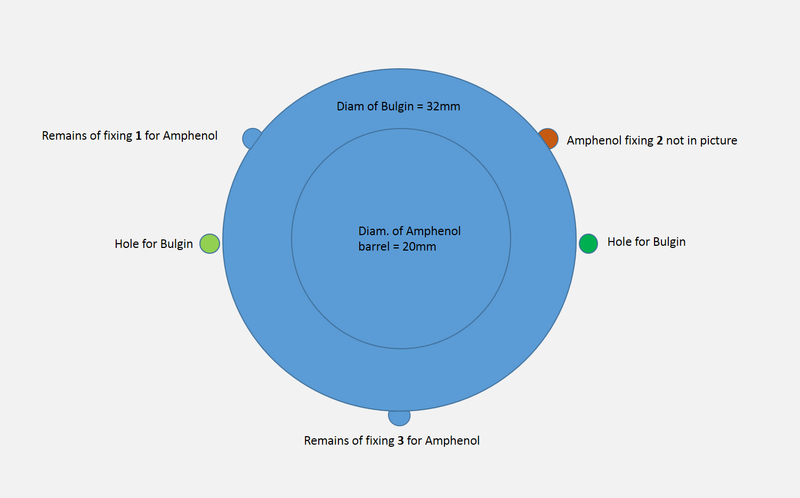 Above, a schema showing the original arrangement, fixing holes for the Bulgin unused either side, and the Amphenol fixed initially at points 1, 2 and 3. Production-sized 7120, but with proto-style elements. The presumption is a factory-made cut-out for the Bulgin socket, and the socket itself fitted at Triumph. This amp was not made for the Beatles. The Beatles’ amps had their own rationale. Could amps set up like the Swiss one (with an Amphenol carefully positioned in a Bulgin-sized hole) have been given to the Beatles? For the time being the question must remain open. However, it is worth observing that lost Bulgin power leads will have been extremely difficult to replace on the continent. Bulgins were particularly British. 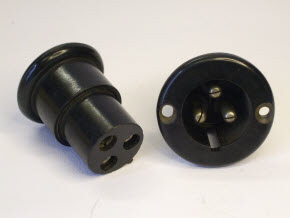 The making or finding of a new XLR-style power socket will have been a simple job for Mal Evans anywhere in the world. Beyond the power plug, there seemed nothing immediately obvious that would help us to understand the dating and construction, or help us to establish a connection or lack of it to the Beatles amps. At this point, all we had to go on were details in small low-resolution photos. As usual, we were left staring at pixellated blow-ups, trying to interpret and compare one pool of dots with another, hoping to find some suggestion of real details & imperfections. This was when we noticed that there was a suggestion in some of the Beatles-amp photos of a rivet, in the same place as on the Swiss amp, just above the power switch. It wasn’t clear, but there was a light patch in the same place on several different photos, enough for us to strongly suspect that this was what we were seeing. If the rivets were there, then so too were the cut-outs. It was starting to look as though the Swiss amp was much closer to the Beatles amps than we’d first thought. So much so that it was helping us to start ‘seeing’ inside the Beatles amps, and start to make some evidence-based deductions about what was going on inside them . Maybe we could use this mixture of inference and observation to unlock some more of the mysteries of the Beatles amps…..? 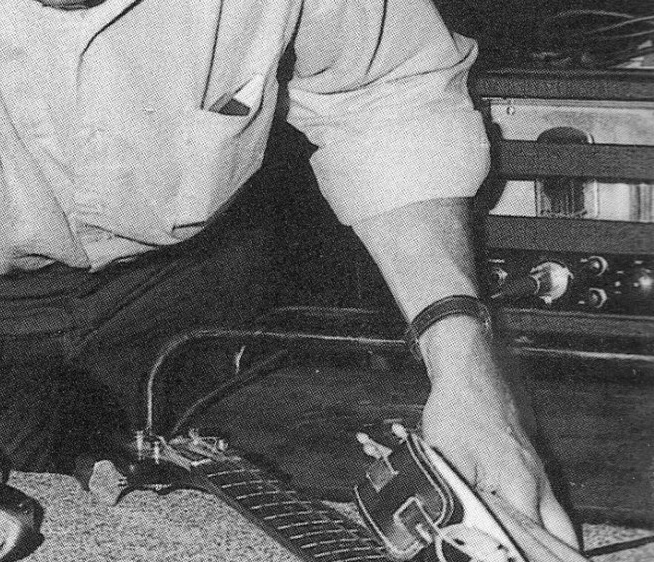 A detail from a photo of Lennon in Studio 2, Abbey Road. The photo is not the one regularly reproduced, but another taken from a slightly different angle.